Is social networking making us dumber? Another great conversation at the Edge weaves together a number of themes I’ve been thinking about lately, like scientific revolutions, big data, learning from models, filter bubbles and the balance between content creation and consumption. I can’t embed, or do it full justice, so go watch the video or read the transcript (the latter is a nice rarity these days). Pagel’s fundamental hypothesis is humans as social animals are wired for imitation more than innovation, for the very good reason that imitation is easy, while innovation is hard, error-prone and sometimes dangerous. Better communication intensifies the advantage to imitators, as it has become incredibly cheap to observe our fellows in large networks like Facebook. There are a variety of implications of this, including the possibility that, more than ever, large companies have strong incentives to imitate through acquisition of small innovators rather than to risk innovating themselves. This resonates very much with Ventana colleague David Peterson’s work on evolutionary simulation of the origins of economic growth and creativity. Author TomPosted on December 19, 2011 September 22, 2017 Categories behaviorTags network, socialLeave a comment on Is social networking making us dumber? Time to short some social network stocks? I don’t want to wallow too long in metaphors, so here’s something with a few equations. A recent arXiv paper by Peter Cauwels and Didier Sornette examines market projections for Facebook and Groupon, and concludes that they’re wildly overvalued. I’d argue that the basic approach, fitting a logistic to the customer base growth trajectory and multiplying by expected revenue per customer, is actually pretty ancient by modeling standards. 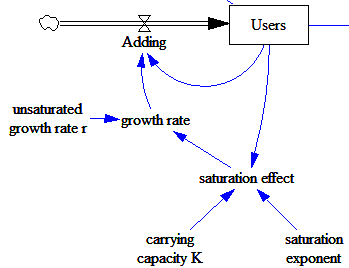 (Most system dynamicists will be familiar with corporate growth models based on the mathematically-equivalent Bass diffusion model, for example.) So the surprise for me here is not the method, but that forecasters aren’t using it. Looking around at some forecasts, it’s hard to say what forecasters are actually doing. There’s lots of handwaving and blather about multipliers, and little revelation of actual assumptions (unlike the paper). It appears to me that a lot of forecasters are counting on big growth in revenue per user, and not really thinking deeply about the user population at all. Author TomPosted on November 16, 2011 September 22, 2017 Categories Models, SystemDynamicsTags network, social7 Comments on Time to short some social network stocks? … the presentation really focused on the challenges that aggregation brings to the modeling disciplines. Axtell presents some interesting mathematical constructs that could and should form the basis for conversations, thinking, and research in the SD and other aggregate modeling arenas. Also, as I linked before, check out Hazhir Rahmandad’s work on agent vs. aggregate models of an infection process. His models and articles with John Sterman are here. His thesis is here. Hazhir’s work explores two extremes – an aggregate model of infection (which is the analog of typical Bass diffusion models in marketing science) compared to agent based versions of the same process. The key difference is that the aggregate model assumes well-mixed victims, while the agent versions explicitly model contacts across various network topologies. The well-mixed assumption is often unrealistic, because it matters who is infected, not just how many. In the real world, the gain of an infection process can vary with the depth of penetration of the social network, and only the agent model can capture this in all circumstances. However, in modeling there’s often a middle road: an aggregation approach that captures the essence of a granular process at a higher level. That’s fortunate, because otherwise we’d always be building model-maps as big as the territory. I just ran across an interesting example. Many behavioral phenomena have been found to spread interpersonally through social networks, in a manner similar to infectious diseases. An important difference between social contagion and traditional infectious diseases, however, is that behavioral phenomena can be acquired by non-social mechanisms as well as through social transmission. We introduce a novel theoretical framework for studying these phenomena (the SISa model) by adapting a classic disease model to include the possibility for ‘automatic’ (or ‘spontaneous’) non-social infection. We provide an example of the use of this framework by examining the spread of obesity in the Framingham Heart Study Network. … We find that since the 1970s, the rate of recovery from obesity has remained relatively constant, while the rates of both spontaneous infection and transmission have steadily increased over time. This suggests that the obesity epidemic may be driven by increasing rates of becoming obese, both spontaneously and transmissively, rather than by decreasing rates of losing weight. A key feature of the SISa model is its ability to characterize the relative importance of social transmission by quantitatively comparing rates of spontaneous versus contagious infection. It provides a theoretical framework for studying the interpersonal spread of any state that may also arise spontaneously, such as emotions, behaviors, health states, ideas or diseases with reservoirs.